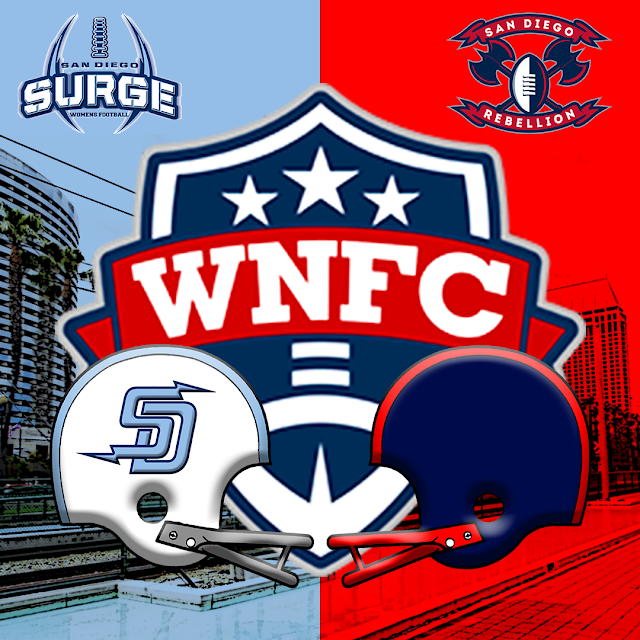 Opening Day of the Women's National Football Conference will feature a marquee matchup between two teams located in San Diego County. While this will be the first time these teams meet on the gridiron, the Rebellion will enter this game with seven players who previously played for the Surge. This second game of this series will take place on May 25th at the historic Balboa Stadium, the new home site of the Rebellion. Breakdown: Following the retirement of Melissa Gallegos, the Surge will enter the 2019 season with a new starting quarterback. While Jamee Avii and Rachael Bell appear to be the top contenders for the job, all-purpose threat Deana Guidry could see some reps behind center as well. After leading the team in catches last year, Jessica Cable will leave her beloved tight end position to anchor the offensive line with consistent standout Eboni Chambers. Sonfre Roberson returns to the defensive secondary coming off a two-interception performance in her previous outing against Seattle. When Guidry isn't making plays on offense, she'll be laying the hammer along side an experienced front seven. Rookies CJ Collier (WR) and Mailo Tuavao (LB) had impressive showings during the preseason scrimmage, and should develop into solid contributors. Breakdown: While a new group of coaches will assist from the sideline this season, Knengi Martin is the undisputed leader of this team. In her second season at quarterback, Martin will get back three of her leading targets from 2018. The acquisition of former Surge receiver Lanika Manning will provide more veteran presence to the passing game. As a rookie last season, Elliot Nguyen earned first-team All-American honors after leading the WFA's Division II in total tackles (93). Kristin Smereczynski recorded the first interception in team history, but as the season went along, she also proved to be factor on offense, where she led the Rebellion in receptions. After five years away from football, Crystal Stokes returns to add fire power to an already stout defensive line.